Whether it is an icy road or blinding blizzard, commercial drivers need to be prepared for whatever hazardous conditions they may face this winter. Operating a commercial motor vehicle during the winter months is a challenge, especially when dealing with rapidly changing weather and road conditions. 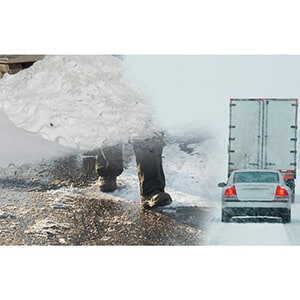 Now is the time — before the hazardous road conditions occur — to go over the basics on how to stay safe during winter months. In addition to the items that should be in commercial vehicles at all times — such as warning devices, jumper cables, tool kit, and first-aid kit — drivers should have a winter survival kit. proper outerwear (extra coat, gloves, hat, boots). Knowing how to react if stranded on the road during a snowstorm is key to driver safety. First and foremost, if a driver is stranded in his/her vehicle, he/she should stay in the vehicle. He/she should never leave for assistance, unless help is visible and close (within about 100 yards). Leaving the vehicle is a dangerous decision, as it is easy to become disoriented in blowing and drifting snow. If able to safely do it, the driver should hang a brightly colored cloth outside the vehicle. He/she should run the vehicle’s engine (with the heater on) for about 10 minutes every hour to keep warm. While the engine is running, the driver should open a window slightly to prevent carbon monoxide poisoning. Also, to prevent carbon monoxide poisoning, the driver should make sure the vehicle’s exhaust pipe is clear and free of snow. Retaining body heat is important to avoid hypothermia, a condition brought on when the body’s temperature drops to a dangerously low level. Symptoms of hypothermia include uncontrollable shivering, slow speech, memory lapses, and drowsiness. Ways to stay warm and prevent hypothermia include trying not to stay in one position too long, dressing in layers, and using any additional blankets and coats to insulate the body’s heat.